German Silver Figure Buckle by Montana Silversmiths. 3" x 4" size. For 1½" and smaller belts. 912L Oil Derrick: 3 1/8" x 4 1/8"
* German Silver Figure Buckle with any of the figures shown here Or select another Figure Buckle from our Catalog of Figures. Please allow 4 - 6 weeks. 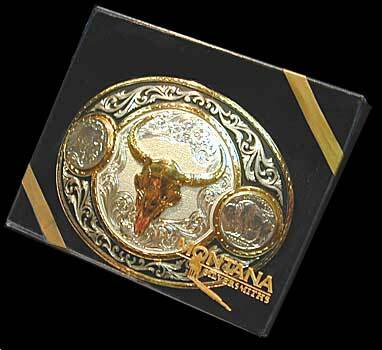 The German Silver Figure Buckle arrives in a nice gift box, ready for presentation or gift giving. German Silver is a trade name for full 18 percent nickel silver polished to a jewelry finish. There is no silver in German Silver. Rope edges are hand-applied jewelers bronze. 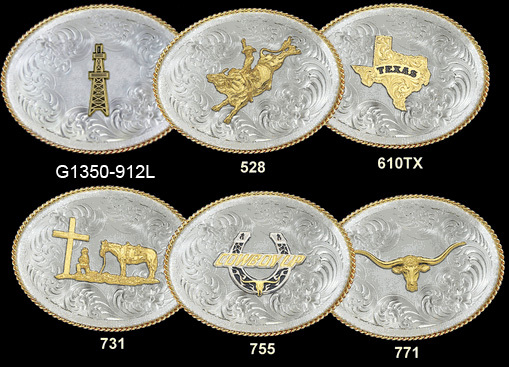 Montana Silversmiths German Silver Economy Nickel Buckles -- like the German Silver Figure Buckle -- are not completely hand finished and may contain slight imperfections.